The Cosmas Vulcan is a 14" high, pull-on bunker style boot that meets or exceeds NFPA 1971, Standard on Protective Ensembles for Structural Fire Fighting and Proximity Fire Fighting, 2007 Edition. VAMP - Full-grain, water, flame, chemical, and cut resistant leather, 2.4 - 2.6 mm nominal thickness, 6.5 oz. QUARTER - schoeller fabric blend with KERMEL significantly reduces weight and is more breathable than leather. Mesh window for enhanced ventilation. PULL STRAPS - Low profile, 1" wide, triple-stitch reinforced, full-grain water and flame resistant leather. FLEX POINTS - Accordion-style flex points behind and in front of the ankle allow the boot to flex where you do, providing improved range of motion. SAFETY TOE - Corrosion resistant, anatomically shaped steel safety toe exceeds all relevant standards for protection. COMBINATION MIDSOLE/LADDER SHANK/PUNCTURE RESISTANT DEVICE - Patent-pending MIDSOLEARMOR combines the functionality of the midsole, ladder shank, and puncture resistant device into a single-piece construction. 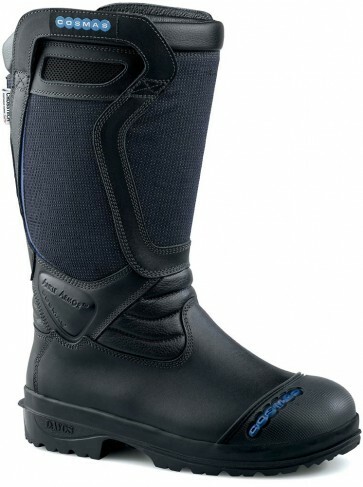 Provides full puncture resistance coverage and thermal insulation for the bottom of the foot. Unique construction is stiff and supportive in the heel and arch areas, yet flexible in the forefoot area to allow your foot to flex naturally. INSOLE - Combination Texon and polyethylene; anti-microbial; wicks perspiration and dries quickly; lightweight with excellent flex endurance. FOOTBED - Triple-density, removable footbed made of Cambrelle, felt, and ergonomically molded EVA. Wicks moisture and dries rapidly. EVA provides cushioning. OUTSOLE - High traction, abrasion resistant, electrically insulating, oil, flame, and chemical resistant, nitrile rubber outsole equipped with ergonomic HEELROLL and TOESPRING to promote a natural walking motion. High profile ladder grips to prevent slips. Specially formulated compound (nominal durometer 66 Shore A) provides superior traction without sacrificing abrasion resistance or durability. Integrated stand-off allows for easy removal of the boot. HEEL COUNTER - Ergonomically molded heel counter provides stability, comfort, and long-lasting support. THERMAL BARRIER - Full-height layer of 300 g polyester felt provides thermal protection. FULL-HEIGHT CROSSTECH FOOTWEAR FABRIC BOOTIE SYSTEM - Five-layer laminate of durable Cambrelle quilted to a 300 g polyester felt thermal barrier, laminated to a CROSSTECH moisture barrier. HEEL SLIDE - Abrasion resistant microfiber suede. No stitching or seams running directly down the center of the backstay in the heel area to improve comfort and prevent premature wear of the liner. SHAFT COLLAR - Soft, full-grain leather-bound padded collar for superior comfort to accommodate individual leg sizes. COMFORT PADDING - Thermal insulating, open cell polyurethane foam padding strategically placed throughout the upper for superior comfort and support. THREAD - Tough, fire-resistant Kevlar thread throughout the upper. OUTSOLE ADHESION - A 2-component, high-temperature polyurethane adhesive system is used to bond the outsole/midsole to the upper. PROTECTIVE TOE CAP - Abrasion, chemical, and flame resistant nitrile rubber protective toecap; 1.8 mm nominal thickness. TIBIA GUARD - Internal tibia guard made of thermoformed polypropylene, extremely lightweight with a specific gravity of 0.75, impervious to water. External tibia guard cover made of abrasion, fire, and water resistant schoeller fabric blend containing Kermel and a reflective background. ANKLE GUARD - ANKLEARMOR contoured ankle guards protect ankles from knocks and dings. MARKINGS  Interior label containing all information as required by NFPA 1971 "Standard on Protective Ensembles for Structural Fire Fighting and Proximity Fire Fighting", 2007 Edition.